For anyone who has ever purchased a timeshare – an arrangement whereby several joint owners have the right to use a piece of vacation property under a time-sharing agreement – the experience can leave one feeling ecstatic. A timeshare can offer a relaxing escape and be the perfect fit for a young couple or growing family. But according to Bryan and Karen Holloway, owners of Lonestar Transfer in Rockwall, many timeshare owners find that as situations change in their lives, they can no longer use or afford the timeshare as they had planned. So how does a timeshare owner go about relieving themselves of the contract and saying goodbye to maintenance fees? That’s where the Holloway’s family-owned and operated business comes in. Bryan and Karen started Lonestar Transfer three years ago as a means of offering timeshare owners a trustworthy and effective way to get out of their timeshare contracts. Lonestar Transfer has since been nominated as a Rockwall Area Chamber of Commerce ‘Emerging Business of the Year’ and spotlighted as a Chamber Partner Business. They have an excellent rating with the Better Business Bureau and excellent reviews on Angie’s List. Their website, LonestarTransfer.com, features local client testimonials, along with a blog that helps timeshare owners avoid scams. “We are committed to helping timeshare owners in our community who no longer want their timeshare. We offer an exit solution that really works. We stop all liability of timeshare maintenance fees,” Karen explained. According to Karen, the majority of Lonestar Transfer’s clients come to them after having purchased a timeshare a few years ago – which worked wonderfully for their family – but they’ve since reached a point in their lives where they aren’t able to use the timeshare as often as they had planned. Frustrated with having to pay yearly maintenance fees, they initially turn to companies that promise to sell off their timeshare, usually for a costly fee. Unfortunately, Karen points out, many of these companies never actually sell the timeshare as promised, leaving timeshare owners in the lurch. “We’ve known several timeshare owners who have been contacted by listing companies promising to sell their timeshare, but in most cases there’s simply no re-sell market to a timeshare,” Bryan said. Lonestar Transfer offers a free, private, no-obligation consultation in which they determine what type of timeshare arrangement the client has, and the cheapest, most efficient and effective way to get them out of it. The consultation can be done in the comfort of the client’s own home, or at Lonestar Transfer’s office, located inside the Rockwall Area Chamber of Commerce building. While there is a fee for Lonestar Transfer’s service, the company offers a written guarantee in which timeshare owners receive a full refund if for any reason the company is unable to help them get out of their deed obligation. “Regardless of whether you choose to use our service or not, we can at least offer you some valuable information and set you in the right direction,” Karen said. But to date they’ve successfully helped over 600 families get out from under their timeshare obligations. Local residents Jim and Sue Hunt fell into the unfortunate trap of buying into a timeshare they couldn’t use as often as they would like. The Holloways kept their promise to rid them of the expensive maintenance fees and timeshare for good. “It was like a two-ton gorilla being taken off our shoulders,” Jim said. “It was a relief to find someone who was truthful and could actually do what we thought other people were going to do,” Sue said. 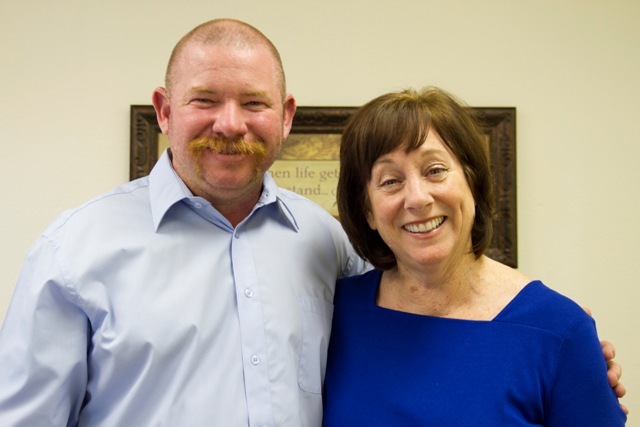 The Holloway’s have deep roots within the Rockwall community. Karen has 10 years experience in the field helping timeshare owners, whileBryangrew up in Rockwall and has family members who were raised here and still live in the area. They enjoy giving back to a community that has been very receptive to them and their business. “Because we’re so privileged to be able to do business in Rockwall, we give back any time we can. We participate in as many community events as possible,” Karen said. They’ve worked closely with Housewarmers of Rockwall and are big supporters of the Wounded Warrior Project, Rockwall Pets and Throwaway Ponies. To learn more, visit lonestartransfer.com, follow them on Facebook and Twitter (@lonestartransfr), or call Karen and Bryan directly at 855-722-3166.